Capture life's special moments in vibrant, beautiful color and detail with the compact and easy-to-use EOS M100 interchangeable lens camera. 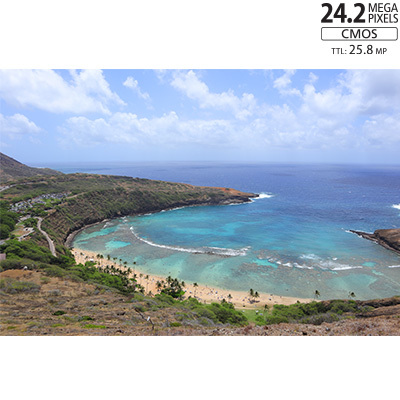 These impressive results are simple to achieve thanks to the 24.2 Megapixel CMOS (APS-C) sensor along with features including a 3.0-inch tilt-type LCD that rotates 180° for artistic angles and selfies, a Self Portrait Mode and Creative Assist to help guide you in getting the shot you want. On the video side, Full HD 60p and Dual Pixel CMOS AF let you record stunning and smooth action, while built-in Wi-Fi®*, NFC** and Bluetooth®*** technology lets you share it all, any way you like. 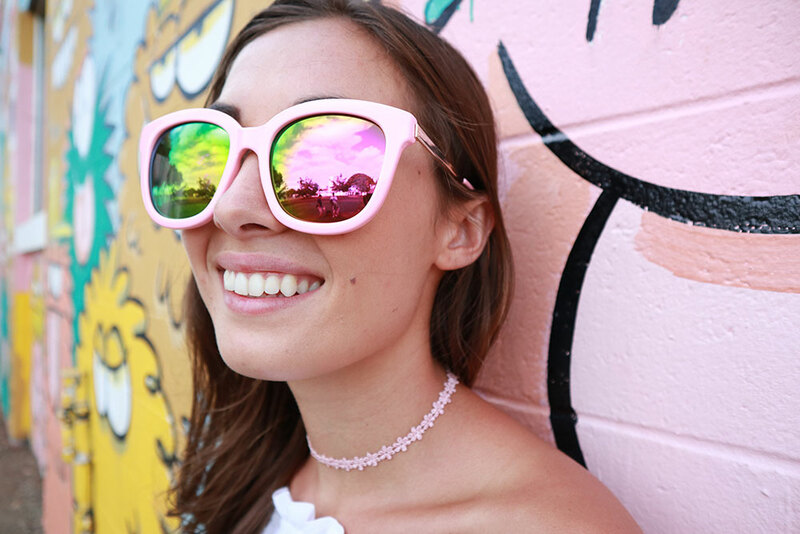 When it comes to capturing the perfect moment, time matters. With the EOS M100 camera, simply line up the shot you want and watch it focus almost instantly thanks to Dual Pixel CMOS AF. Equipped with phase-detection, it offers fast, smooth and precise autofocus that stays locked onto your subject, even if it is in motion, for both photos and videos. 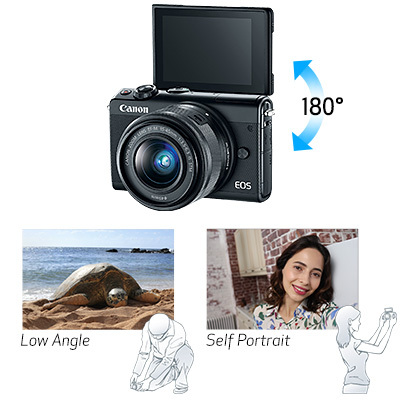 The Canon EOS M100 camera has a powerful 24.2 Megapixel CMOS (APS-C) sensor that can capture high-resolution images of immense quality in a wide variety of lighting situations. Take photos and videos with fine details and dynamic, rich colors from the deepest reds to emerald greens to lush blues and purples. Built-in Wi-Fi®*, NFC** and Bluetooth®***. 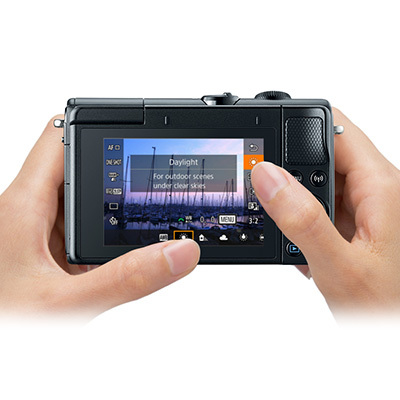 The EOS M100 camera is designed to make using Wi-Fi®* connectivity fast and easy. It can transfer files directly to a compatible smart device using the Camera Connect app. 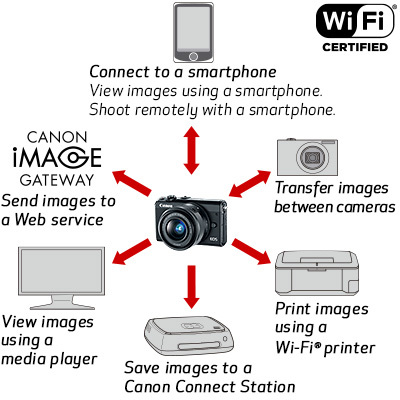 Simply connect to the Camera Connect app* to transfer images to your smart device, then share and upload from the device directly to various social media sites and web services like Facebook®, YouTube® and CANON iMAGE GATEWAY# as well as print directly to compatible wireless Canon printers. 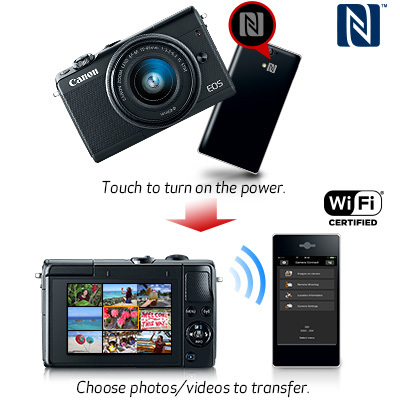 You can also exchange data with other Wi-Fi® compatible Canon cameras. 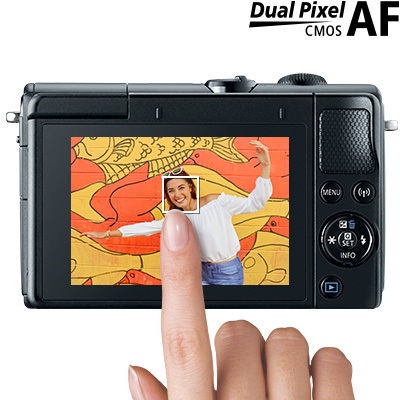 With its built-in NFC (Near Field Communication) capability**, the EOS M100 camera connects directly to compatible Android devices as well as Canon's Connect Station CS100 device by simply touching the NFC icon located on the camera to the device. 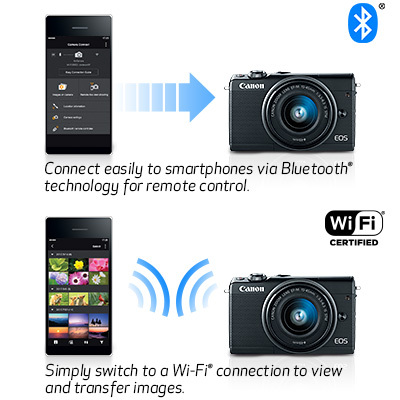 Bluetooth®*** pairing helps you connect the camera to compatible smart devices using the free Canon Camera Connect app*. This low-energy wireless connection helps preserve battery life while allowing remote control of the EOS M100 camera. 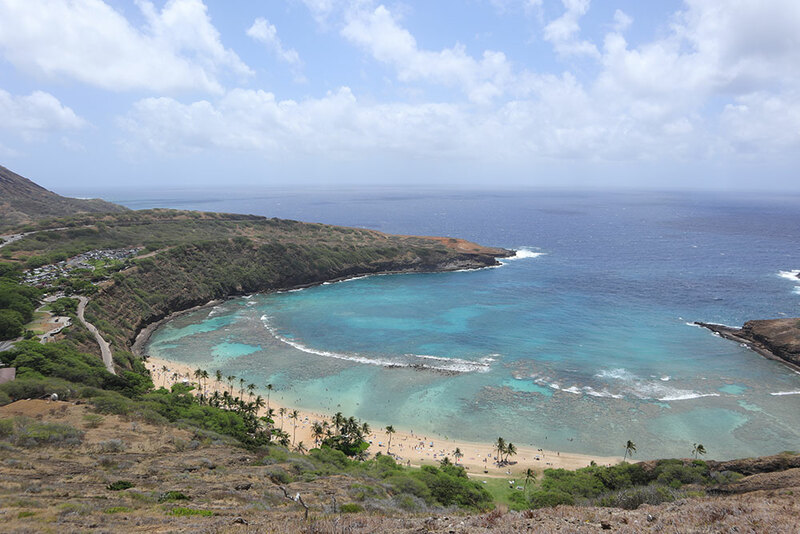 It also sends continuously updated GPS location data from your phone, letting you geotag what you've captured so you can know precisely where you took that epic vacation photo. You can also establish a direct Wi-Fi® connection to use your phone as a viewfinder, as well as check and download previously captured photos and videos. *** Compatible with select smartphone and tablet devices (Android™ version 5.0 or later and the following iOS® devices: iPhone 4s or later, iPad 3rd gen. or later, iPod Touch 5th gen. or later) equipped with Bluetooth® version 4.0 or later and the Camera Connect App Ver. 2.1.20. This application is not guaranteed to operate on all listed devices, even if minimum requirements are met. The EOS M100 camera's 3.0-inch touchscreen has approximately 1.04 million pixels, letting you preview images in high detail. 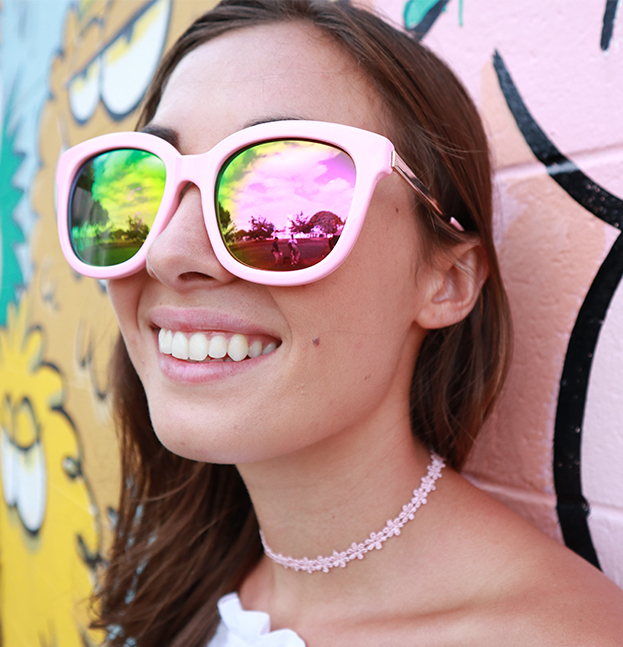 It can pivot a full 180°, meaning you can capture a unique low angle view of the world or flip the screen up to get a perfect selfie. Thanks to a simple menu design and a responsive 3.0-inch touchscreen, the EOS M100 camera is easy to use with just a touch. A single tap lets you select where you want to focus, helping ensure the photo you take is sharp and in focus. Menus are easily accessible with either hand, so you don't have to take your finger off the shutter button to adjust a setting quickly. Scrolling through images you've taken is as easy as a swipe, and you can zoom in to check detail and focus with two fingers. 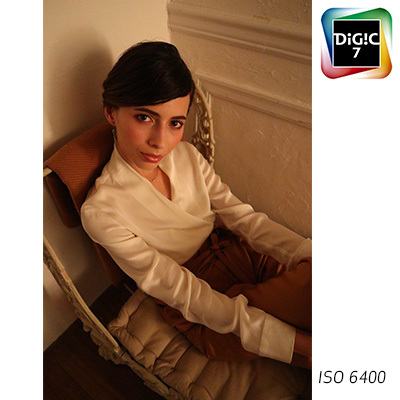 DIGIC 7 Image Processor, ISO 10025600. The DIGIC 7 Image Processor powers the Canon EOS M100 camera to produce high image quality and fast operation, even in in low light. When using high ISO settings, the image processing helps keep results sharp and detailed in virtually any lighting situation. Powerful all around, the DIGIC 7 Image Processor helps ensure your photos and videos look sharp and lifelike with minimal noise or grain. Capture all the action with the EOS M100 camera's Full HD video recording. With 1080p resolution you can get fine details like a puppy's snow-covered fur in the winter or a friend's face at his/her surprise birthday party. 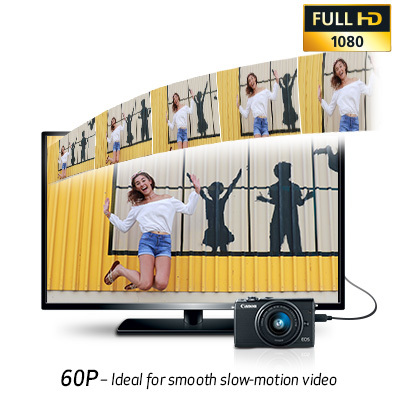 Recording at 60p means you can capture even fast-moving moments like a budding athlete's first goal or the splash of the summer's first jump in the pool. Continuous Shooting at up to 4.0 fps (up to 6.1 fps with AF Lock). Sometimes you can't be sure when the perfect moment will happen. The exact moment a dog catches a ball, the one time your group of friends looks right at the camera and smiles. 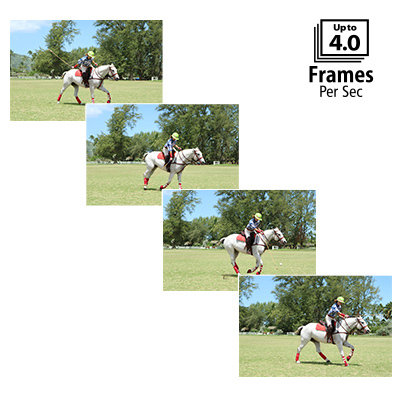 With continuous shooting at up to 4.0 fps, or up to 6.1 fps with AF Lock, you're able to capture multiple photos in a short span of time, helping you get the exact moment you want. The EOS M100 camera's built-in Creative Assist feature makes it simple to change camera settings and see the results in real time, helping novices and professionals alike find just the right look to match the emotion or tone of the image. 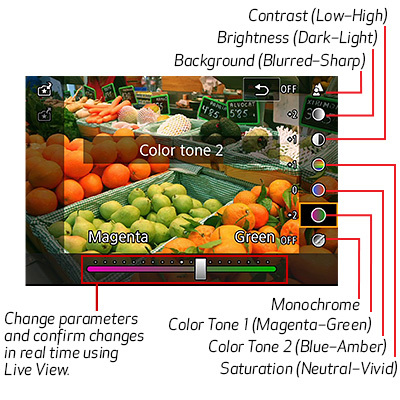 Up to seven personal settings can be saved and applied to future images, including a new magenta to green color tone option, which can be useful for fine-tuning color under fluorescent lighting. Additionally, images shared from other photographers can be imported into the EOS M100, which can then display their settings and even apply them to the scene at hand. By helping the photographer understand how different settings affect the look and feel of the photo or video, the EOS M100 can be an excellent tool for experimenting with different photography styles. Everyone wants to look great in photos, and the EOS M100 camera's Self Portrait mode helps make sure your selfie captures you looking incredible. With this mode you can make adjustments ranging from smooth skin tones and background blurring to brightness and more. On top of that, a customizable self-timer helps makes sure you capture the picture you want, whether you need two seconds to flash a quick smile or ten seconds to gather your friends together for a group photo. In order for a camera to capture that perfect moment, first you have to have it with you. With its compact and lightweight design, the EOS M100 camera is easy to hold and easy to carry, whether slipped into your pocket or a bag. From vacations overseas to local adventures at the park, the EOS M100 can be ready at hand to capture life's best moments. Compatible with EF^, EF-S^ and EF-M Lenses. The EOS M100 camera is compatible not only with the growing range of EF-M lenses tailor-made for EOS M series digital cameras, but also the extensive line of Canon EF^ and EF-S^ lenses available for other EOS cameras. This gives access to dozens of different creative choices. 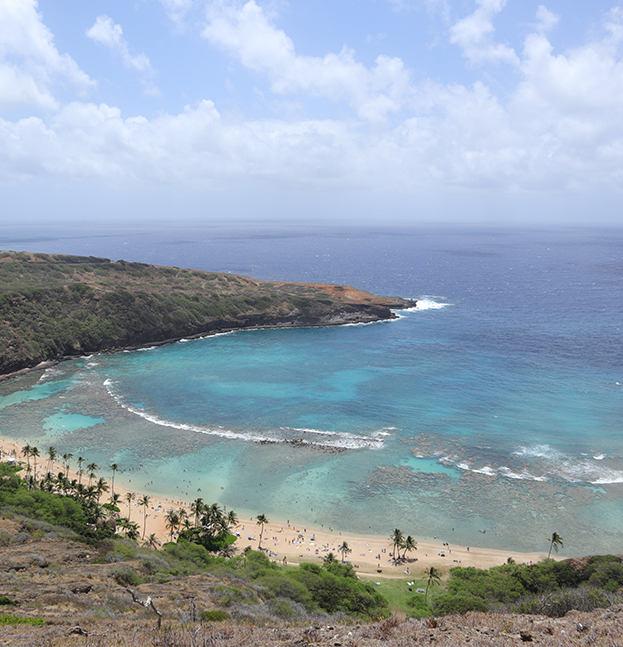 Want an ultra wide lens for crowd shots and big nature images? How about a telephoto for wildlife and close-up action shots? Those, and many more, are available to suit whatever style of photography you enjoy. 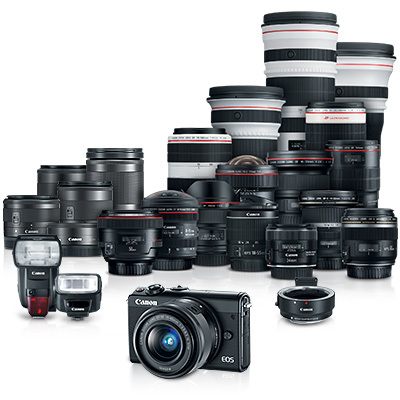 ^ Optional Mount Adapter EF-EOS M is required when using EF/EF-S lenses with EOS M series digital cameras. Shutter Speed (TV) 1/640 sec. Shutter Speed (TV) 1/200 sec. 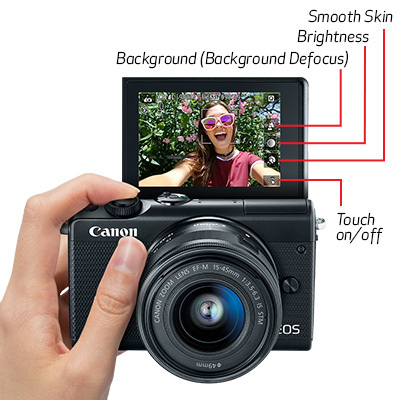 The Canon EOS M100 interchangeable lens camera can take your photography beyond the capabilities of the average smartphone and lets you have plenty of fun in the process. See how the Canon EOS M100 can make your everyday life fun and exciting, helping you create vibrant and detailed photos and videos anywhere you go.